But what about the Egyptian rites? What are they to us? They are a parody, an imitation, but as such not to be despised. For all the great age and consistency of their rites and teachings, which certainly command respect, the Egyptians did not have the real thing, and they knew it…. If the Egyptian endowment was but an imitation, it was still a good one, and we may be able to learn much from it, just as we may learn much about the early church from the vagaries of the Gnostics. But it is not for a moment to be equated with the true and celestial order of things…. I’m particularly impressed with the latter statement, that the newest scholarship in Egyptology is very educative-apologetic in nature to the LDS Church, even without realizing so, demonstrating in clear terms that the elements of the LDS temple practice today are of very ancient character, and wholly unsuited to have arisen in Joseph Smith’s time and environment. The more we learn about what the Egyptians were up to, as well as many other ancient civilizations, the more they fit squarely into Joseph’s model of the eternal order. What is even more astounding is that none of these findings or scholarship were available to Joseph in his day, but have just recently come to light in the last few decades. How Joseph knew, in the early 19th century, the deeper meanings of certain Egyptian hieroglyphics and themes has yet to be explained by our critics. The Latter-day Saints believe Joseph was inspired by God, and that he restored an ancient order that has existed from the eternities. I thought this was interesting, so I did a bit more research. What I found was that there are many explanations for the ankh symbol, some of which are very insightful to latter-day saints, but for which there is not a consensus among Egyptologists (this goes for many hieroglyphics). One this is sure, however, and that is that the ankh is one of the best-known Egyptian symbols – it is found everywhere in sacred Egyptian artifacts and texts. Indeed, it is also found prominently on facsimiles 2 and 3 of the Book of Abraham. This view is further substantiated given that the earliest or most archaic examples of the ankh show the lower section split into two parts – the ends of a bow.5 Carol Andrews tells us that “the most detailed examples [of the ankh] depict binding at the base of the loop”6. Such representations of the ankh can be seen in the center of this Relief of Thutmose I, in this particularly detailed relief, or in this engraving. 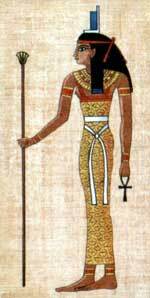 The ankh is often set in the same category as the Girdle of Isis, as a symbol of eternity. This is not because its straight lines may be lengthened in the imagination to infinity, but because they converge upon and meet in a closed loop. This loop symbolizes the inexhaustible essence of the life force identified with isis, from whom life flows in all its forms. It is therefore carried by all those who wish to share her life. Hence the ankh may be identified with the Tree of Life, with its trunk and foliage…. What is even perhaps more interesting than what the symbol alone represented is how the Egyptians used this symbol in texts and drawings, and how it fit within their ritual worship. This will be explored in the next installment. I like the idea of ankh representing a knot, as in tieing or binding through covenant…that’s what leads to eternal life. Also, the image of the circle being the sun, or heaven/the eternities/etc., the horizontal line being the horizon, or the veil/death/etc., and the straight line being the straight and narrow path/iron rod/etc. that leads to the veil/death and our eternal heavenly home. Very interesting post. I have an acquaintance who has long taught this idea that the ankh is the knot in the sash of the Egyptian ritual clothing. A faint remembrance of the Egyptian ritual is preserved in the ritual of the academic trade guild (the graduation ceremony) wherein the mortarboard tassel (a relic of asian kingship) is shifted from the left to the right. From his notes: as part of their ritual, the Egyptians swore an oath or a covenant as in Psalms 24. The sash of their ritual clothing represents the string that binds the umbilical cord at birth–representing life. Bergman suggests that ankh also means “oath” – that one swears by one’s life so that if the oath is broken, so likewise ‘the cord of life,’ i.e. the umbilical cord is broken. There is in some colleges and universities a practice of moving the tassel from one side to the other on graduating, but this is a modern innovation which would be impractical out of doors due to the vagaries of the wind. However, this mark of transition to graduate status has the benefit of taking less time than more traditional indicators such as the individual conferring of the hood, or a complete change of dress part-way through the ceremony (as at Oxford in the United Kingdom). Apparently, such a change of dress still occurs in the graduation exercises of Oxford, one of the oldest universities in the world. A really interesting article! I spent time in Egypt in the late 80’s and have a great fascination with the myriad of practices, symbols and beliefs. There seems to always be something new to learn. You have given me several more things to ponder. Interesting! I didn’t really understand the symbolism of the tassel movement until now. A couple points. From the Book of Abraham we can see that when Abraham went into Egypt it operated an apostate priesthood. But I am not sure that was always the case. The people of Abraham and Joseph had a big influence, at times, on the Egyptians. Then there is the Hyksos who ruled Egypt, they were children of Shem. This idea of a rope and a knot is very interesting. I have contended that the knot corresponds to the altar in each glory, and is tied there in that glory by a nail, or a “vav” and that the vav is a symbol of the covenant and atonement. You can read my comments on that topic HERE. See my new posts on the Oxford University degree ceremony.